I believe 1m is quite close, you might be suffering from receiver overload on one or both devices. Now I moved the endpoint further away from the gateway 10 meters and 40 meters and repeated the test. Same result. Also, my gateway has been having trouble maintaining uptime of more than a day. It usually reboots it self anytime between 2 minutes and 1 day (have never seen uptime longer than a day on it). After it reboots it seems to be “fine” according to info page and according to blue LEDs, but not I’m not sure it is. Don’t know if it’s a coincidence or not, but just as I was doing those 10 and 40 meter tests with endpoint, that’s pretty much the same timeframe when the gateway rebooted again. I don’t know if that’s coincidence or if what’s happening is that any time any traffic comes in it causes the gateway to reboot. Will need to do more testing on that. The gateway won’t transmit unless commanded by the backend network. You should be able to see in the logs that the gateway pushed the received messages across the internet. No idea why it’s rebooting on you, unless there is some kind of power issue. If you can’t see the join requests in the devices part of the console, I’m guessing that there is some kind of mismatch with your device eui, dev key or application key, but that’s a guess since I’m still trying to wrap my head around all these concepts. Edit:. I’m thinking you should see some activity in the gateway traffic page, regardless of any key mismatches. You have to have that web page open before you try your join. There is no historical ability, only what’s happened since you opened the web page. By the way, your gateway status message above shows that 4 messages have been uplinked to the network. I suspect your problem lies in the endianness of your IDs or keys being sent by the node. Are you sure that your device configured through the console is using exactly the same device eui that the node is using? Update: I did the tests again and I don’t think those 4 messages belong to me. This time I watched the gateway traffic the whole time and nothing showed up. Also after all that testing I’m still showing 4 messages received by the gateway (at least this should have gone up). I don’t mind the reboots (no reboot close to the time I was testing BTW), but I keep thinking my gateway isn’t passing the traffic properly. Maybe I should take a field trip to the next closest gateway and try registering there. I bet it will work from there. Regarding the endianness of my IDs or keys - I’m not sure what you mean. I know that data representation can be big-endian or little-endian, but I’m not sure how that’s related to what I’m trying to do. I got EUI from device info, registered the app and then copy pasted appEui and appKey from the console and tripple checked it. I will quadruple check it, but I’m not sure what I’m looking for. Are you sure that your things uno is transmitting on the right frequency band for your region. I’m in the US, but I have found that a great many example programs and default settings lean towards the EU setup and must be overriden. I’ve never used the things Uno so I don’t know how it is configured out of the box. I do know that my allegedly US gateway came setup as an EU ready gateway. Just chiming in. I have the same problem, but my UNO was working fine, Then I started to get “Join not accepted:denied” But the interesting thing when I go to the gateway console traffic, I can see that the join was accepted. Tried to join my Uno from there, but I get the same problem. This leads me to conclude that my gateway is working fine. When I got back to my gateway I hooked up a USB-UART cable to my gateway and according to the status I think it is working fine. I don’t know what causes this “slow” mode, and I don’t really know what fixes it. Sometimes the “slow mode” goes away after I press the reset button. Sometimes when I unplug USB and plug it back in. But the more I fight with this, I think it just “fixes itself” after a while until it breaks itself. I can’t find any pattern. I also tried running it headless with help of LED flashes to help me understand what’s happening under the hood, and I think I have the same problem even when I take the serial communication out of the picture entirely. Am I chasing a red herring with trying to figure out this “slow mode” problem? Even when this “slow mode” isn’t present, join still fails. Thank you all for help … I hope I don’t run into further trouble after this, but I am still scratching my head regarding that “slow mode” weirdness. That’s quite old, isn’t it? Current version is 1.0.5, and 1.0.3 dates back to October 2017. 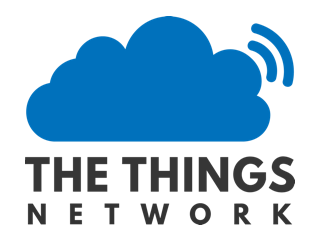 Maybe see TTN Uno - RN2903 firmware upgrade. If the Join Accept can be seen in the gateway’s Traffic page in TTN Console, but is somehow not received by the node, you’ll still see “denied”. And when not accepted then TTN will not send anything at all. 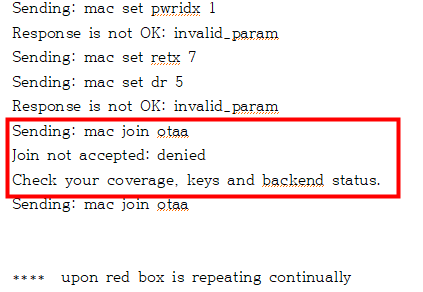 So, “denied” really means that the node did not receive anything. I’m surprised because all day yesterday I did many reboots of it and it consistently did “Send command succeeded”. (I did have trouble receiving at the console, but at least it didn’t fail outright like now) It appears that I somehow lost registration. I tried rejoining, but I’m back to the join not accepted problem (and no - waiting it out doesn’t help, it doesn’t join even after 15 minutes). How does a node lose its joined status? me either . I can’t find what is wrong… I think I did all right.